Sales charts are, as a rule, somewhat dull. That is, except when they are interesting. Funny that, no? And the most recent Japanese sales charts do have one intriguing factoid. 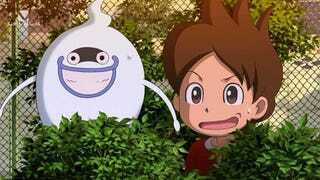 The biggest selling game in Japan for the week between April 28 to May 5 is Yokai Watch for the 3DS. According to Famitsu, it sold over seven thousand copies—two thousand more than the number two game, Mario Gold World Tour—and is actually running the risk of selling out. Okay. So what, right? Well, what makes this interesting is that the game is not new: Yokai Watch was first released in July 11, 2013 in Japan. At that time, the game, which is developed by Level-5 of Professor Layton fame, was not quite the juggernaut it is today. However, as Kotaku previously reported, the anime, which started this past January, is incredibly popular among Japanese children. And thus, the game is now a big hit. There is sequel slated this July, and it is also for the 3DS. Expect it to do well, too.